Eilen jo hieman vihjailin tänään ilmestyvästä joulukortista, jossa pääsin testaamaan näitä uusia Woodwaren joululeimasimia. Kuvan ja tekstin leimasin suoraan korttipohjaan. Kellot leimasin vielä toiseen kertaan Stora Enson 4CC-paperille, väritin ne promarkereilla, leikkasin irti ja kiinnitin kuvan päälle. Koristeina erikokoisia sinisiä arkyylijalokiviä sekä hieman jouluista blingblingiä Sticklesin midnight blue -sävyisellä kimalleliimalla. As promised yesterday, here is the Christmas card I made with these new Woodware stamps. Image and sentiment are stamped straight on the cardbase. Bells are then re-stamped on Stora Enso 4CC-paper, colored with ProMarkers, cut and attached on the image. For embellishments I used different sized rhinestones and for some extra bling I added midnight blue Stickles. I love your fresh and modern looking Christmas card in blue and white. A super and very elegant Christmas card Eemelie. Love the stamps and your choice of colours for this lovely card. A real gorgeous CAS design! Fab stamps and colour! A super bell stamp, I love your colouring and added embellishments. This is a beautiful card, thanks for joining us over at Stampotique this week. Great card... blue is my favourite colour. Kauniit siniset värit ja upea leimasin! Beautiful card with a lovely image, thanks for sharing at Sparkles Christmas. A fabulous card - I love this stamp and have got it on my wish list! Thank you for joining us at Sparkles Christmas Challenge. Beautiful image and a lovely card. The stickles colour is perfect with this design! Thanks for taking part in the November Rudolph Days Challenge. Good luck in the prize draw. 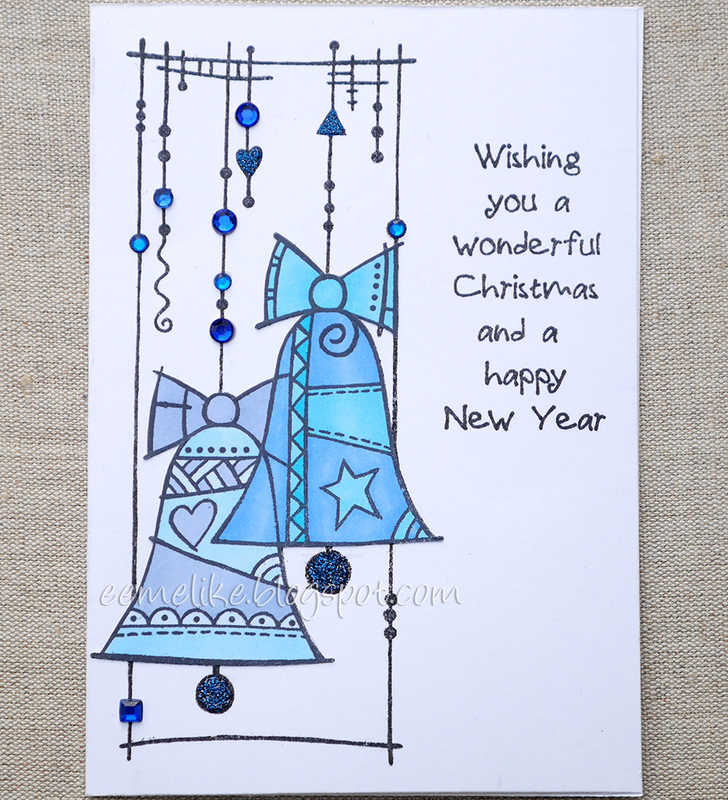 I love these doodle bells and they look great in blue and white too. Really lovely fabby colours and great image. Thanks for joining us over at PFP this week. Ihana kokonaisuus - timantit täydentää leimakuvaa! !